Hello! Because I tend to get tired of things quickly and because our wood blinds had been on the windows the entire 5 years that we've lived here, I decided to change up our kitchen window treatments. I came across this photo and have been drooling over it ever since. So, I thought I'd give it a try. I picked up some coffee bean sacks at my local farm supply store and got to work. It took all of 5 minutes. I'm so happy with the result and it was so stinkin' easy! How great was it that the coffee sacks fit the width of the window perfectly. All I did was attach them to the inside of the window trim with screws, bunch up the fabric and tie it with hemp twine that I already had. Simple and cheap! Obviously, this part is just for looks and I needed something for privacy on the lower half of the window. So, I found some corresponding inexpensive fabric that looked like some kind of faux linen, $3 per yard, and sewed some cute little cafe curtains to pull at night. I already had the little cafe rods that I purchased from Lowes years ago. You can't really tell from the photos but the two textures together are wonderful. Love it! It's something small that makes me smile every time I walk into the kitchen. And because I picked up some extra coffee sacks, I thought it would be fun to share two sets with two readers that would like to do the same, or something different! There are two of these.......measuring 26 1/2 inches x 40 inches. And two of these.......same measurements. To enter, just leave a comment! Two winners will be randomly selected and announced on Saturday morning, October 15. Comments will be closed Friday night, October 14.
love the coffee sack window treatments and your mini cafe curtains! and I'd love to win a pair of them from you! What a great idea! 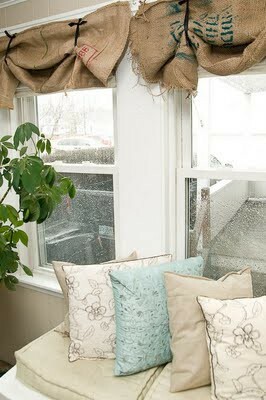 I would never have thought to use coffee bags for window treatments-love it! What a wonderful addition to your gorgeous kitchen!! I have been wanting to get my hands on some of those sacks, maybe for pillows. gah! I can't get over how wonderful everything looks! Working on getting things ready to build a farm house, and these are just what I need for our kitchen. Such a great idea! I absolutely LOVE your new kitchen window treatmenta now! They fit your kitchen design perfectly. I have some coffee sack items in my kitchen too and would love to win these that you're offering. Please pick me!! I just love your blog ever since I found it. I love, love, love these! I can never find them around here. What a great giveaway!! I have a little coffee room and these would be the icing on the cake!! LOVE them! Crossing my fingers tight! I have a chair I would like to reupholster using these! I may have to go to my tractor supply store and see if I can come up with some of these, or perhaps win them! They came out great! Keep the pix coming, they are great and give me inspriration! love the way it turned out. Looks great in your kitchen! Beautiful. I love it. Very unique. I love your kitchen too. Thanks so much for the chance. I absolutely love it, and I love your style. So glad I found your blog! What a great idea! I'd like to make pillows from coffee/grain sacks. I've haven't found them in my area so it would be great to win these! I love your curtains...how cute! I have a chair I have been wanting to reupholster & I think these coffee sacks would look fabulous! wow--those are GREAT!! Would love to cover a couple cain back folding chairs i am working on with those babies!!! Thanks for having such an awesome give away!! I love the coffee sacks!! Your window treatments look so pretty, great job! Would love to win a couple for some fun projects! Very cute idea for the coffee sacks! I desperately need to update my decor (or complete lack thereof) and these would be great. Especially with my coffee-addict hubby. Love your site overall. I've got the perfect project in mind for these! Very NICE ! ! i love your kitchen taps they are great too,. Perfect for my kitchen !! Love it! Your home is beautiful and inspiring. These look great in your kitchen. I admire your hard work on everything in your home & the best part is that everything has a great story behind it. These 'curtains" would look great in my kitchen as well. Thank you for the opportunity for someone to win these! ohmygosh! what a great idea! They look awesome. I would totally love to play with a set of those in my kitchen. You are a genius! Adorable. What an awesome idea! I Love it! I would so Love those in my kitchen! Thanks for sharing! Swoon! I love these - they look so good. How perfectly fitting for your kitchen. How fun it would be to win a set. I love your website and these window treatments look awesome. This would be perfect to do for my kitchen window. I would SO love those!!!! How cute! Love the look. Thanks for the giveaway! Eek! These are too cute! Hope I win! Love the windows! Awesome give away. Sweet idea and equally sweet giveaway. I wouldn't even know where to find coffee sacks in our area. Happy Fall and God bless! Fantastic! 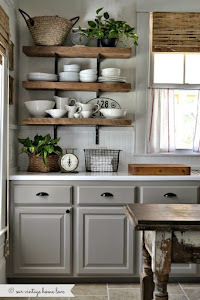 I love how rustic and yet, still clean and bright your kitchen is! I was just wondering to myself "Hey Self? Where do you think you might find a local farm supply store to get some coffee sacks?" and then I finished reading your post and I was all "Hey Self! Look there! She's givin' a couple away! Maybe you'll win!" Beautiful bags! Great giveaway... Thanks! Where did you find the coffee sacks? I've been on the hunt for some cheap ones but the only ones I find are on Etsy and really expensive... Either way I love your creativity! Wonderful idea! Thanks so much for the giveaway opportunity! I would love these. I think I would make a table runner-rustic and beautiful at the same time. Thanks for the opportunity to win. Oh La la, count me in. But by chance I don't win, what is a farm supply store? That sells coffee sacks? I must find me one. what a great idea! i think my kitchen window would look great like that too! They look great! Such a nice touch to your kitchen. Thanks for the giveaway! LOVE LOVE LOVE this idea! I would totally swap out my curtain window treatments for these in my kitchen! Thanks for the giveaway! Gah! I so can't find any of those up here!! And Diana I have to honestly tell you that your blog is my absolute Favourite!!! Your house is GORGEOUS! super cute! I just love your style. Love it love it!!! WOW!! You are so talented and sweet! I would love to win! I have always loved old coffee sacks but never had any! !Your kitchen is just lovely-totally my style of kitchen! Looks great, I would love to try that in my bathroom. I have been in my house for 5 years and STILL have no window treatments on them, lol! I would LOVE these!! I love them! I just took my curtain down over my sink to wash it a couple days ago and decided once it was down that I need a change. These would be perfect! Love, love, love them!! How very creative!! Love your idea. Your kitchen is beautiful. Would make doing dishes feel like fun. I live in a rental house with very sterile white blinds. These would be wonderful to give some character to my kitchen. What a great idea! I absolutely love your idea of coffee sacks as window treatments and have been looking for a cute idea for my kitchen window, would love to win a pair of these!! Thanks for all your great inspirations!! That has got to be the easiest window treatment I've ever seen......I love it!!! Would also love those coffee sacks! Oh these are great! I love coffee sacks! Super idea! All of it coordinates and looks great in your kitchen...which I love. :-) Do you mind telling me about the white canisters you have on the right side of the sink? I love the various sizes. Such a great idea and a new spin on something vintage looking. My grandmother would love the idea if she were still here. She had a lot of flour sack and coffee bean sack creations! Oh, these would go perfectly in my kitchen. Thanks for the chance to win them. I can never find them around where I libe. Love these! What a great idea!! I love your kitchen! Love this idea and it would be perfect in our kitchen! You are so talented. I would look at this and want it but never know how to makie it happen like you did. Awesome! Your curtains are stinkin' cute!! I woulf love to give them a try! LOVE! I have a similar look in my kitchen with just plain burlap...but I would love to switch it up with the bags! Two, two, two tips in one! Great tip on finding the sacks at a tractor supply store and an even better one on how to hang them! I am so lucky to have come across your blog. I'm a newlywed who just bought my first fixer upper, and your decor attitude and way you find possibility in everything is so encouraging. We are making our own farmhouse style table soon! When we finally get around to do the kitchen I plan on using yours as inspiration! God Bless. Ps. My hub is a firefighter too! What a great idea. Would love to win !!! Can I first say- I LOVE your new window treatments! They look lovely. :) Secondly, sign me up to win! I'd love to have some lovely curtains too! I love love love these! I especially love the ones with New York on them since my hubby and I went there this past spring. You are such an inspiration and I love all of your decorating ideas!!! What a wonderful idea! I am tired of my blinds too, and would love to do this! Love your blog! Oh I LOVE your idea!! I always thought it would be cool to make a bag/purse out of a coffee sack - I never would have thought window treatments! LOVE the coffee bag curtains! Would love to have them in my home! It was creative and it showed your initiative in finding an alternate window curtain. Looks so vintage too. I have been hoping to find 2 matching coffee bean sacks for months now.......I hope I get lucky and win one of the two sets. I love the window treatment..Clever and looks awesome..I would love to be entered in your giveaway.. These are great! Love the idea and use. Would love to win these! Great blog, thanks for sharing your life! Thanks for the chance to win such a great prize!! What a fantastic idea. I recently discovered your blog and have found it to be very beautiful and inspiring. Every time I check to see if you have any breadboards available, they are sold out! One of these days I hope to be able to purchase one. I would love to be entered in your giveaway. My contact info is bwrawling at gmail.com. I love your style! i have the perfect window for those. Love! I'd be thrilled if I won! BRILLIANT!! I would make these for my laundry room doors!! Wow, these turned out fabulous! Love Love how they look! These are just FAB!!! You are truly an inspiration to my wife and I! Too cute! Thanks for the cafe curtain idea! I posted about that sam inspiration shot a couple weeks ago too! Unfortunately, we don't seem to get things done around here as quickly as you guys do. Your new windows look fantastic! And I would love to win a couple more coffee sacks, of course! Love the new window treatments! You are right, they are perfect! (And they are inspiration - we're building a house in the spring and I'm putting together some ideas - and your windows are definitely in!). Wow! What a really great idea! I LOVE coffee and these would look terrific in my kitchen. I'm new to your blog but I'm finding inspiration on each page I look through. Keep blogging!! I would LOVE these!! Thank You! LOVE YOUR IDEAS, AND LOOK FORWARD TO YOUR POSTS! THANKS FOR THE INSPIRATION. Would love to have this and do the same in our home! They look wonderful! I would love to win some. Thanks for the chance. My mom told me about a bunch of burlap sacks at a garage sale today. When I got there they were all gone...lame! I was already in love with cushions made by coffee sacks...now I'm in love with blinds too!!! Great job!I can't wait to start my mine! I am in the process of transforming my home into something that I can love! You give me hope! I know what I like, and you have shown me how to make the things I have always been drawn to into something spectacular! I would love to own these bags, and they would fit my windows perfectly! Thank you for the inspiration! The coffee sacks are great! And I love your blog! Ilove it! These would look awesome in my kitchen! These are awesome! They would look great in my kitchen! Wow! Those look fantastic in your kitchen! Ooh! I've been wanting some coffee sacks! Thanks for the chance! Wow!! What a great idea. I am going to be on the lookout for some coffee sacks. I love your blog and can't wait to check out all the new things you are making, expecially the cart and your bread boards. You are an inspiration to me. This one is fabulously looking one of the extreme way about inexpensive window treatment. And authentically, the each of pictures of this post are solidly looking just exceptional about it. I am totally impressed. Thanks for sharing. I took a short (aka 2 day) break from blogging and came back with a better attitude: to only post when I had something good. I post about once a day to every other day now. Not only are my posts better, but I am more relaxed about blogging now. That is an unexpected window treatment. Your neat kitchen and the rustic window treatment surprisingly complemented each other very well! Also, your material is washable. Because of that, you don’t need to replace it often. That is a practical design tip for everyone! Omgeee this is fabulous!! Iike yours better than the inspiration photo! Rustic luxe! !